Avast Passwords is now locked up since this morning after the FireFox Update 60.1 so had to reset passwords in Avast Premier which wipes out all the stored passwords. I reset my password for Avast Premier too. 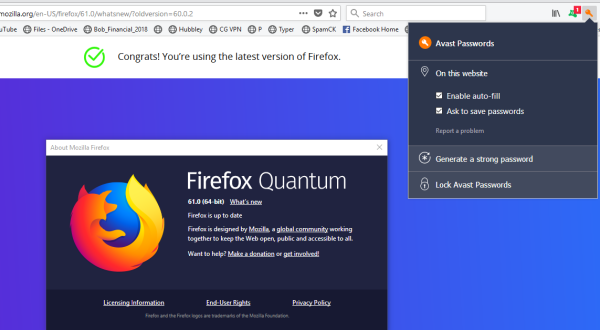 I don't know how to get Avast Passwords working properly again with FireFox. Were you able to get it working again. I don't know alot but I'd be happy to try and help somehow if you're still needing it. Hopefully someone who knows more will show up soon! I had the same thing happen, however I never set up a Masterpassword which leaves me unable to unlock application. 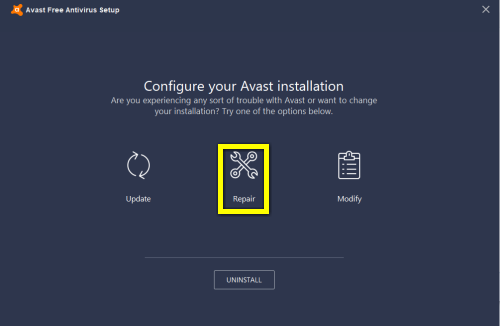 I tried to use my email to reset it however avast does not recognize my email. This is a serious bug and not user error. The first step in using the product it to set up the master password. If you never set up a password then you also aren't storing anything. Thank you for the reply... I installed the program 4/2017 and was never asked to set up a master password. The program was storing my passwords and I was able to use the browser extension to use them online for at least a year. That changed when I updated Firefox and I am now locked out. I use windows 10 and when I access the control panel the only options I have are remove and change. There is no repair option available. I have the same problem with chrome. It locked itself and refuse the main password. Clearing the passwords to remove it , it did not worked. And yes, I am ABSOLUTELY sure it was the right password. I had to cut internet, uninstalled avast, clean the installation, reinstall everything!